For those of you playing or looking to play Bulletproof Blues on Roll20, we have good news! 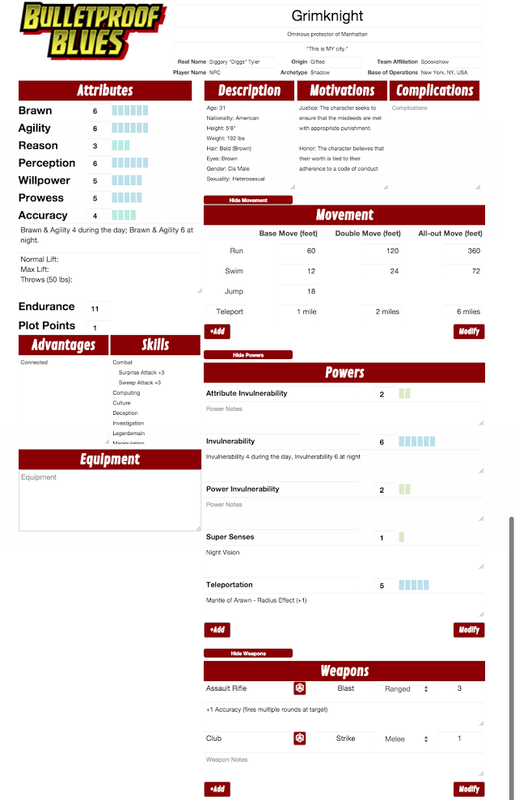 Gareth Davies asked the Roll20 Community to code a character sheet, and community member GV kindly obliged. Screen shot of the sheet below! This is a commission by artist John Zeleznik: “Black Orchid”. Black Orchid guards the Kalos Universe from threats some consider to be… unnatural. Folks who supported our Bulletproof Blues Second Edition Kickstarter will get a high-resolution copy of Black Orchid along with her write-up (look in your Backer Rewards vault!). This was not a stretch goal: it’s a bonus, to thank our supporters for their patience and generosity. 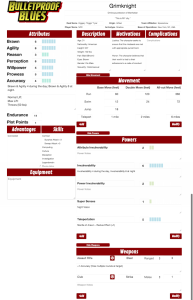 Black Orchid is also available on DriveThruRPG as a special “One-Shot” Character Art Pack, with her character write-up using the Bulletproof Blues Character Sheet Helper.